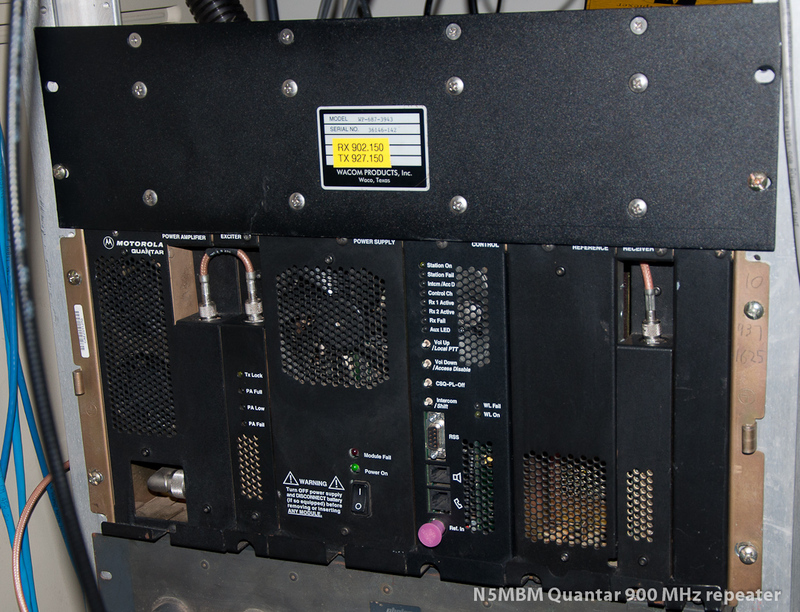 We are now running a 100w Motorola Quantar repeater on 900 MHz. When you want to install a quality radio repeater, it is difficult to beat Motorola. Sure, there's lots of other companies out there selling good quality gear, but Motorola typically builds their stuff like tanks! And the Quantar line of FM repeaters is no different. For 900 MHz, I wanted something I could install and pretty much, more or less, forget about and it would just simply "work"! 100% duty cycle, no excuses. Then a set of compact copper duplexer cavities showed up on ePray and I grabbed that too. A Wacom WP-687-3943 900 MHz Diplexer converted into a duplexer set up for the ham bands. Between these two units I have the whole setup in only about 16 inches of rack space! My rack space is at a premium, but it is space well dedicated. It will last for years. Built like a tank and reliable. The new Quantar arrived via UPS and it worked right out of the box – having been pre-programmed with my frequencies and my call I had to do little more than slide it into the rack, plug it in and turn it on! The cavities took me about an hour to get tuned up right and they work great! I also put in line a 900 MHz circulator to protect the amp from antenna problems in the future. Now comes the sticky bit – getting this new repeater interfaced to the Allstar controller DMK URI's proved to be a bit frustrating... There aren't many people out there making them! However, there are people out there on the web (Ebay) that make these cables and I can tell you from personal experience – some of these dedicated guys on eBay and other sites make cables better than some "commercial places" and certainly MUCH better than I could do myself with my tired old eyes and shaky soldering iron. Enter Northcomm Technologies! They make excellent Quantar cables. After receiving one from them and having had to disassemble it and put it back together – THIS company makes excellent cables! I took the time to LOOK at his connections – every single one was first rate. They use expensive connectors, for good reason! They use quality wires in their cables and did an excellent job of protecting it with a sleeve and installing a toroid. If and when I have to do this again for another repeater, Mark at Northcomm Technologies will definitely get my business! When I had questions or issues, Mark was quick to get back to me and answer all my questions and even gave me some information I didn't have and needed to make it all work. Once I had everything programmed, wired properly, hooked up and plugged in, it worked like a charm! Finding a Quantar cable to work with a DMK URI is difficult, Northcomm Technologies helped make it easy. Our 33cm system uses a Comet KP-20 900 MHz antenna with 9.2 db gain at 35 ft. AGL, fed with 1/2" Heliax. The 900 Mhz band is seriously UNDER-utilized, in my opinion, and I think that they could use some more activity. If we don't use it, we could lose it!